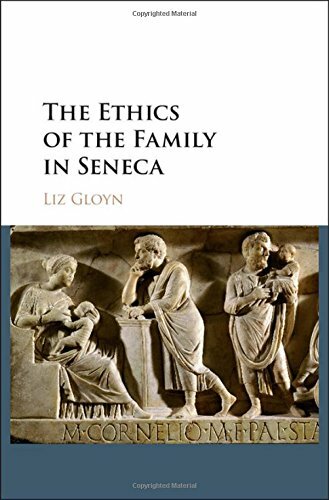 Liz Gloyn's new book The Ethics of the Family in Seneca offers a careful exegesis of letters and other key texts written by the famed Stoic sage, Seneca. The texts rallied here demonstrate that in the Stoic view, the family provides the primary setting for the development of virtuous character for individuals and for learning to conduct healthy human relations outside the home. The Stoic worldview places the individual at the center of concentric spheres of human interactions that increasingly reach from inner life outward to relationships in the external world. Thus oikeiósis is "the primary building block of human relations" in the texts studied here. Gloyn unpacks in this book fundamental Stoic insights into virtuous character development, showing that the ethical truths that apply in the primary site of family life apply consistently in society at large and across the political sphere. Gloyn seeks to demonstrate through a study of a variety of Seneca's texts that familial rhetoric can be successfully deployed to foster philosophical and ethical development, an approach to teaching and learning virtue that she sees reflected broadly across Stoic philosophy. In Gloyn's study of de Consolatione ad Marcium and de Consolatione ad Helviam, she shows how Seneca addresses women in their role as mothers to highlight the critical significance of mothers for their children's moral development by paralleling the mother's creative role to that of Nature in bringing the universe into existence. This simile recalls the unremitting consistency of Stoic cosmology that holds fast from the micro- up to the macro-level, such that what is true and good at the level of the cosmos is also good and true in the minutiae of everyday family life. The study of de Consolatione ad Polybium, Gloyn shows how Seneca extends the meditation on virtue by employing the model of the cosmopolis or universal city to argue that all humans are siblings in reason and thus moral obligations necessarily surpass the familial setting to include all people as biological and spiritual brothers and sisters. This section of the work demonstrates the core Stoic dictum of brotherly moral support and obligation in Seneca's call to his audience to model the secure relations of the home site in their relationships far beyond the home, so that ultimately, relationships across the human network can survive adversity and provide a conducive setting for moral development of all individuals. Gloyn's analysis of Seneca's views on marriage rest upon his De Matrimonio and other texts. Contrary to the claims of some scholars, Gloyn demonstrates that Seneca is no anti-marriage misogynist. Rather, she shows that the Stoic argues that marital relations can provide a pivotal site of ethical stability where the Stoic sage can work on attaining virtue. He also insists that women are as capable as men of attaining virtue, so together the Stoic couple can support each other in their moral progress. In the final study, Gloyn analyzes Seneca's views on fatherhood. She shows that in most of his writings, Seneca's views are traditional and in consonance with Roman views in general. However, in her study of the De Beneficiís, Gloyn offers a close readingthat unfolds a radically new Stoic view of the father-son relationship that abandons the usual hierarchical restrictions of oikeiósis and aims instead for a new dynamic that benefits both father and son, both materially and ethically, thus overturning well-entrenched Roman traditions of familial interactions. Stoicism calls its practitioners to live by a higher pattern of life. Gloyn's painstaking exegesis of Seneca's texts demonstrates from many angles that for the Stoic, home is where the ethical life begins and it remains ever the stable center of ethical gravity, the lifelong support for ethical development and the model for all external relationships. Gloyn does fine work of clearly unpacking the details of familial life in Seneca's philosophy, but the rigor of her arguments render the text most suitable for specialists.